In the forward to his 1907 songbook, Scots-Irish socialist James Connolly wrote: ‘No revolutionary movement is complete without its poetical expression. If such a movement has caught hold of the imagination, they will seek a vent for the aspirations, the fears and hopes, the loves and hatreds engendered by the struggle.’ It didn’t start out that way but visiting the 2016 Edinburgh film festival during one of the most troubling times in our history I found myself wondering if the documentary film had become our movements’ ‘song’. The film Shadow World grabbed my attention and held it, as it did the festival jurors, who awarded it top prize. In testament to the film’s power, it has become the primary filter through which I now view the anti-Corbyn coup. Based on journalist Andrew Feinstein’s book of the same name, director Johan Grimonprez’s stunning visuals, rather than simply serving the story, brings poetry to its telling. 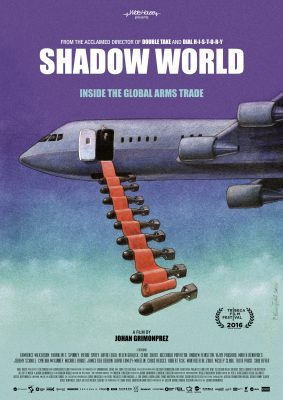 Much will be familiar to Red Pepper readers but by linking these images to a coherent narrative around the arms trade it offers the kind of powerful clarity that only poetic expression can. It was an emotional screening. Jo Cox was dead, the referendum lost and the Labour Party coup had just been launched. Consequently, it is difficult for me to separate what was said in the film from what Feinstein said in his post-screening Q&A. His central thesis is that the three ‘great’ arms-dealing nations, the US, UK and Israel, have created the realpolitic of our time, a state of perpetual war that offers them untold riches and us untold misery. Each country has its own distinctive offer. The US produces quantity, so it can deliver efficient and effective weapons at a reasonable price. However, its reach is limited by anti-corruption legislation that complicates things when bribes are required. Which is where the UK comes in. With no such restrictions, Tony Blair emerges as the arms trader par excellence strutting his stuff on the international stage backed up with mega bribes where required. Israel’s USP is that its weapons demonstrations are live, often involving reducing Gaza to rubble. It’s truly heart-breaking stuff, and when you see the lengths they go to get their way you can’t help but see the anti-Corbyn coup as the industry flexing its muscle – anybody who might cast light into their ‘shadow world’ will be neutralised. As Feinstein explained, the US arms industry has already put more money into Hilary Clinton to defeat Sanders than into any other candidate ever, and the presidential campaign proper hasn’t even started. Shadow World would suggest it’s no coincidence that the Labour hawks have led the coup and, like their mentor Tony Blair, they may not have to wait for heaven for their reward. In one of the film’s lighter moments, film-maker David Lawley-Wakelin admits that when he found himself in a position to famously heckle Blair (while giving evidence to the Murdoch enquiry) he secretly rang his mum and she said he might as well. 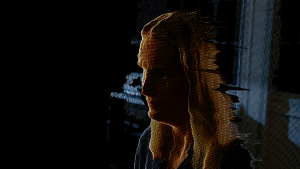 Director Alex Bibney’s Zero Days explains why we may have missed the opening shots in the world’s first cyber war – it was a 1-1 draw. The US melted a few Iranian nuclear fuel enrichers, Iran then equalised by wiping out the databases of a US oil company and shutting down three large banks for a day. The film follows the story, which begins with the US developing the massively complex computer virus, or malware, which became known as ‘Stuxnet’, as a way to stop Israel from bombing Iran’s nuclear power stations. However, Israel – looking to maximise the damage – then released the malware indiscriminately into the Iranian system, the result being that it started turning up across the world and commercial anti-virus companies were brought in by worried companies to investigate. Put simply, Stuxnet finds ways to switch off machines without the operators knowing. Eventually, the Russians cracked it and handed it over to Iran, whose bright young hackers now had the blueprint to do the same to the US. The trouble is, nobody can talk about any of this because it’s officially secret, so we witness various ex-state security bosses not denying it with accompanying knowing looks. Once again, it was whistleblowers, including Edward Snowden, who thought democracy might be best served if we the people knew that the big money was going into cyber warfare. The reality of this new warfare is terrifyingly mundane: rather than bombing a hospital you can simply switch off its power. Almost all of our machines were linked to the web at a time when such sophisticated malware was science fiction but all can now be turned on and off by a smart piece of undetectable computer code – and they are not easy to turn back on. It is a complex subject made comprehensible with the use of Matrix-like graphics. Chicago Boys is a more traditional documentary that tells the story of the Chilean students sent from the Catholic University to study under Milton Friedman in Chicago, and how they seized the opportunity of the Pinochet coup to implement their neoliberal economic policies – which provided the blueprint for both Reagan and Thatcher, and underpin all our lives today. 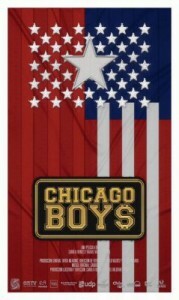 Disturbingly, the film allows the Chicago boys to speak for themselves. At times it’s chilling, especially when Sergio di Castro, Pinochet’s finance minister, says he was ignorant of the torture and murder of the socialists who opposed his reforms. By and large the boys are content to celebrate the ‘economic miracle’ that is Chile today. I talked to director Rafael Valdeavellana afterwards. He defended his decision to give the boys a platform, explaining that young people in Chile had become alienated by the bitter left-right political rhetoric but had been engaged by his film and educated to the reality of the individualistic philosophical base of Chile’s economy. Niam Itani’s Twice Upon a Time is a different kind of documentary, a highly personal look at war from the experience of the refugee child. The humanity and compassion of the victims of perpetual war is revealed in stark contrast to the arrogant strutting of its perpetrators. This wonderfully plotted story takes three parallel and inter-connected stories and weaves them into a compelling narrative. The simple truth of what compels a family to flee and the discovery of the film-maker’s own family’s tipping point is as human and ordinary as it is surprising. 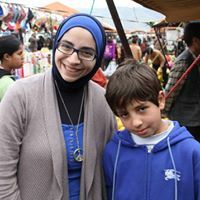 Fleeing Beirut, Niam’s mother comments that they didn’t think they were becoming refugees. Niam remembers little of her own childhood flight and the war she fled from, apart from happy memories framed by photographs, so returns to her ‘home in exile’ to discover it now occupied by a young Syrian family from Daraa. She befriends young Khalil and sets herself the task of giving him happy memories. Twice Upon a Time stirred me to action, its honesty, simplicity and authenticity made me cry. It wasn’t the festival experience I had expected, and it sat quietly at odds with the red carpets and parties offered by film companies to attract media attention to their product. I’m unsure as to how many of these films will get distribution but they did offer poetical expression to our struggle. Activists could do worse than support and arrange screenings of these powerful films.